Shanghai’s precious land resources in downtown have given birth to many peculiar buildings in order to make the best use of space. A residential building near the Bund has become an Internet sensation because one side looks extremely thin from a certain angle. It has been dubbed a “paper building” and the “thinnest building in the world” in a report in UK tabloid newspaper the Daily Mail. Photographs of the structure at 400 Ningbo Road in Huangpu District have been circulated on social media with some bloggers pointing out its resemblance to the Flatiron Building in New York. However, the building’s residents have been struggling for decades, lacking private kitchens and a gas supply. The building was built in the 1920s in the Wuxi Community, a dilapidated neighborhood with rows of shikumen (stone-gate) and old apartment buildings. It sits on the corner of Ningbo Road and Fujian Road M., a few steps from the Bund and Nanjing Road Pedestrian Mall. One side of the structure extends to make use of a gap between it and a nearby residential building. “Shanghai has many such irregularly shaped houses due to the city’s high land prices,” said Xue Liyong, a senior researcher at Shanghai History Museum. The house on Ningbo Road is an extreme example, Xue said. 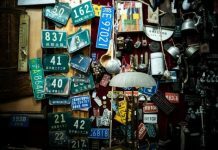 Retired bus driver Ping Lu’an has been living in his triangular 24-square-meter apartment on the building’s top floor for more than 40 years. Photographs of the family’s apartment are among the most widely circulated because it is at the thinnest end of the building. “People got interested in the novel appearance, but can hardly imagine our suffering inside,” the 63-year-old said. The triangular space is in three parts — a small bedroom for their divorced son, a bigger living/bedroom for the couple and a bathroom at the thinnest tip. Ping said he can hardly turn around when washing. Ping moved to the apartment in the 1960s with his parents, who were attracted by its ideal location, south-facing windows and good ventilation. But they later found the apartment was damp and many irregular spaces were useless. Due to its shape, for instance, the family can’t have a dining table as it would block the way to the bathroom. They are also struggling with low water pressure and an often clogged toilet due to the building’s infrastructure and the strange shape of the apartment. 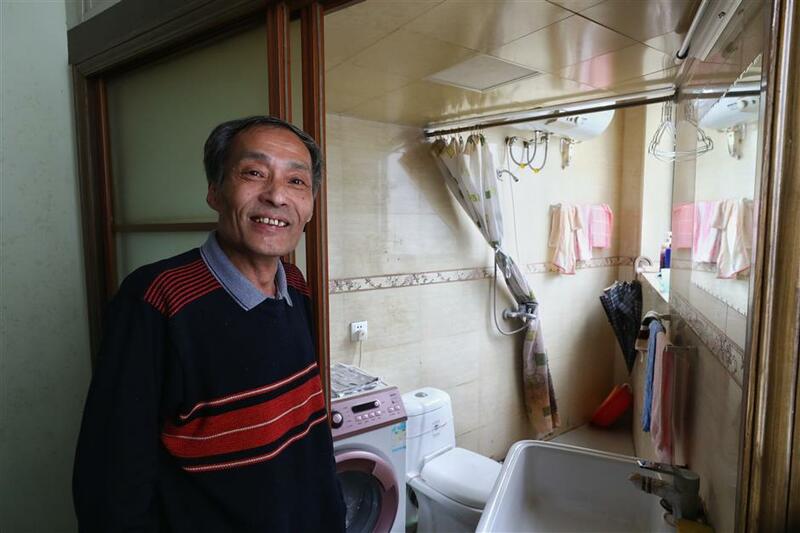 “We hope we can get relocated from the peculiar apartment soon, so that my son can get married again and we can enjoy our twilight years,” said Liu Jianping, Ping’s wife. Over 40 households like Ping’s family live in the four-story building. Some are still using chamber pots and cooking in the corridors. Electrical wiring on the walls is covered in black oil and dust. “When a housewife fries fish in the corridor, the smell spreads over the building,” said Chen Tianqing, the building chief who also lives on the fourth floor. Her father-in-law, who once operated a shipping company, owned five apartments in the building but later sold them to neighbors when business was bad. The structure was initially built as offices, so there was no gas or toilet facilities, Chen said. She lives in a former accountant’s room, while her neighbor surnamed Tang lives in a former storage loft. Half of the narrow corridors on each floor are occupied by storage cabinets, stoves and liquid gas tanks. “When housewives cook together at dinner time, it feels like a smoky and noisy night market,” she said. Her neighbor, 86-year-old Tang, has to climb steep wooden steps to enter her single-room apartment. At night, she covers the entrance to the stairway and sleeps on the ground. “A thorough renovation is essential for this so-called wanghong (Internet sensation) building,” Chen said. Ling Ji, director of the Wuxi Road Neighborhood Committee, said committee officials and volunteers had spared no effort to help improve the residents’ living conditions, not only in this building but also in the other old residential houses under its jurisdiction. Some 1,600 households live in the area, with 30 percent of them elderly, Ling said. “I hope the public can pay more attention to the living environment in the region, apart from the paper building,” she said. The committee has launched many campaigns aimed at improving the environment. Several illegally built balconies on the building, for instance, were demolished last year, while indoor bathrooms have been installed. Residents have been weaving sweaters for elderly people living alone, and handicraft workshops are held on paper-cutting and lantern making. Children have been organized to create paintings on public walls and visit nearby museums. “Though we can hardly improve the facilities, we can make the residents feel the warmth,” said Ling. Huangpu District plans to renovate 8,000 households in old residential buildings each year from now to 2025, said Hong Jiliang, the district’s deputy director. The district has the largest remaining area of the city’s rundown lane-style neighborhoods, covering some 2 million square meters, which feature cramped living space and shared bathrooms and kitchens. About 65,000 households in the downtown district still use chamber pots. The district government plans to finish renovating all such houses, those in the worst condition without a private toilet or kitchen, like most parts of the Wuxi Community, by the end of 2025.